I got the opportunity to spend the afternoon at my friend Anna’s house and she helped me learn how to make homemade bread dough that can be used for lots of different things. I recently got a Wondermill Wheat Grinder from my friends at Life’s Daily Bread and wheat berries, so now I just needed to know what to do with it! 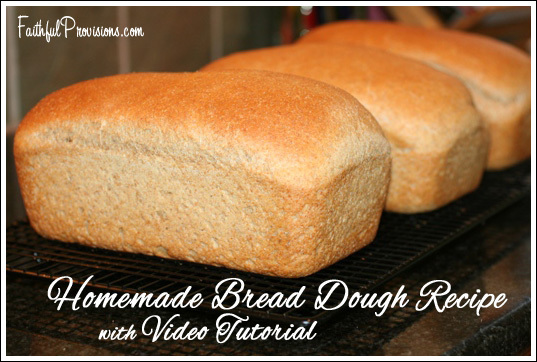 In the video below, Anna is giving tips on how to bake your own bread, how to knead the dough, rising tips and anything else that might help. She has a Bosch Universal Mixer, and she doubles the recipe below. I took her recipe and cut it in half so I could do it in my Kitchen Aid Mixer with my dough hook. Only run for about 10 minutes in a Kitchen Aid or it will get tough. Place yeast, water and honey into Kitchen Aid Mixer. Let sit 10 minutes to proof yeast. While yeast is proofing grind wheat (or measure out store bought). TIP* Spray measuring cup with oil, that way the honey slides right out with no mess or waste. Combine flour and sea salt. Don’t ever add salt directly to yeast mixture, it will kill the yeast. Next, add oil to yeast mixture, then add 8 cups flour mixture (w/ salt), vinegar and fully mix. Add additional flour if dough is sticking to the sides. You have enough flour if the sides are clean and the dough is on the dough hook without really sticking to your fingers. Let the machine run for 8-10 minutes. Drizzle oil on counter top and drop dough out onto it and begin kneading. I prefer to knead with oil over flour, less mess and it keeps the bread moist. Oil bowl and place dough back in and cover with a towel and let rise 20-30 minutes. It should double in size. I usually place mine under a light in a warm area. UPDATE I now let my dough rise two times, then once in the pan. So a total of three rises. It made all the difference in my bread loafs. Details below. Once it has doubled in size , punch down, place back into bowl and rise another 20 minutes, covered and in a warm place. After second rise, punch down a second time, and pinch off dough into 3 balls. Don’t tear, it will destroy yeast fibers. Knead each piece individually until smooth. Once bread loaf is ready, spray bottom of pan only (not sides, dough can’t rise properly if it is slick). Lay dough in glass or stainless steel bread loaf pan. Let rise (double in size) 20 minutes to one hour depending on the temp in your house (in summer it takes 30 minutes, winter closer to an hour). It has finished rising when it doubles in size, or you poke and it doesn’t spring back. If you forget about it and it rises too high, it will flop in the middle during baking. If this happens, punch it down and start over again with the another rise. I set the timer for 20 minutes, then preheat the oven. That usually gives me a total of 30 minutes to rise. Put into a 350 degree oven for 25 minutes. Let it cool on a rack immediately, it will get soggy if you leave it in the baking pans. *UPDATE* I now let my dough rise two times, then once in the pan. So a total of three rises. It made all the difference in my bread loafs. Details below. Let rise (double in size) 20 minutes to one hour depending on the temp in your house(in summer it takes 30 minutes, winter closer to an hour). It has finished rising when it doubles in size, or you poke and it doesn’t spring back. If you forget about it and it rises too high, it will flop in the middle during baking. If this happens, punch it down and start over again with the another rise. I was wondering how long you bake the bread loaves. (And what temperature) Can’t wait to try this recipe! Jen– So sorry! I added it to the end of the post, but put it into a cold oven, turn to 350 degrees and put in for 25 minutes. So glad you posted this! What can I use instead of the kitchen aid…would a mixer do or simply by hand? Thanks! Yes, it should be fine, or you can do it by hand just fine. You just have to hand knead it longer to develop the gluten. I loved that little video! I am going to try this on the weekend, I hope mine look as great as hers! Do you have a recipe for the cinnamon sticky buns? I’m looking forward to trying this batch recipe. Thanks. Lauren – I thought I already put those up! Yes, I’ll work on getting that up for you this week. Thanks for the reminder. I just tried this recipe. It turned out great! The tips were so helpful, along with the video. I have been trying to perfect yeast bread for a while. Thank you! Have you tried freezing this recipe? If so, do you freeze the dough, or do you bake first then freeze? Just curious to see how it does! Jen – I freeze it for pizza dough all the time. IF you liked precooked pizza dough, that would work great too. We prefer very thin dough and I like to cook it when we are ready to eat it. But, for bread, hamburger buns, rolls and cinnamon rolls I cook and then freeze. I think that works best. What kind of flour should I buy to make this? How to make ham. buns? If your bread has three rises and you want to freeze the dough for later use so you can have fresh-baked bread on another date, when would you freeze the dough? After the second rise, before the final rise? Should you shape it first? I think it would be best to freeze after the second rise. Then let it thaw at room temp. Once it is thawed, let it rise 30- one hour, just have it double in size. I know it takes longer to rise with the thaw. Anyone else have suggestions? What kind of store flour should I use for this? How do you make hamburger buns? All Purpose flour will work great. I used to buy frozen bread dough and I think it called for on the package to put it in a 200 or 250 degree oven for an hour or so to defrost & rise at the same time. Might be something some might want to research cause my memory is a little foggy on the temp. I just remember it working really well. When you freeze store bought bread, do you double-bag it in an additional ziplock, or leave it in the wrapper it comes in? Is there a “trick” to making it last longer in the freezer? Sarah – I always double bag store bought bread. At the very least, take it out of the store packaging and put in a freezer bag. Be sure to get as much air out as possible to prevent freezer burn. A good trick is to freeze the bread first for an hour or two. Then once it is frozen, put it into a bag and squeeze all the air out. That prevents it from getting smushed! What type of store bought flour do you recommend? Stephanie, I make bread all the time and I use King Arthur Whole Wheat Flour, but I deduct 1 cup of the whole wheat flour and replace with regular bread flour- and I also actually add around 2 Tablespoons of Wheat Gluten to mine so it has a better consistency and texture. Kelly, I made your bread last night and my 17 year old daughter was ecstatic! I have been making the artisian whole wheat bread which I like but it gets really hard. This bread is soft and delicious and I love it. Do you have a recipe that uses mostly whole wheat flour that will turn out as well as your original recipe??? Kathy – I am so glad you enjoyed it! I use all Whole Wheat flour for this recipe. We have a grain mill, so I do half hard red and white white wheat berries. So a mix of wheat flour types. One more thing! How do you make the hamburger buns? Kathy – Just take the dough and shape into “puck” size rolls. Let them rise about 20-30 then bake. Thanks Kelly..I made this recipe last week-end and will make it again tomorrow. My parents said it was the best bread ever..great compliment when my mom has made her’s all from scratch too!! I made two loaves and a dozen rolls in my kitchen-aid…awesome!! 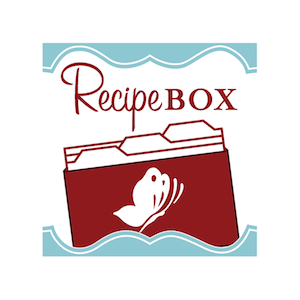 This is the most amazing recipe of all that I’ve tried, it is just what I’ve been looking for. Thanks! How can I do this gluten free? I have a grain mill and quite a few grains like brown rice flour, millet, quinoa, some buckwheat flour. My boys are pretty gluten intolerant. One can’t have any at all and the other one can in moderation. I love your website. You have inspired me to unleash the homemaker within and save money and budget despite my son’s 5-6 food allergies! That is the best bread recipe I’ve ever used! My husband loved it and I’m pretty excited about making it again. Hopefully I will get good enough at it that it will eventually replace the store bought bread we have. Can this dough be frozen & used to bake bread after it’s thawed? If so, what steps do I take? where is the video? I don’t see a link. Me and my family love love love this bread! I want to make loaves for loved ones for Christmas and make goodie baskets. How do you think that the bread would hold up to being mailed? I am doubting that it is possibility but have a lot of family hundreds of miles away. Thanks so much for this great and easy recipe! I think if you did 2 day shipping, it would be just fine. Just ship it out the day you make it, after it cools, and wrap it in saran wrap and cover in foil to keep in the moisture. Don’t ship hot or the sweat from the heat will make the bread soggy. Let me know how it works out! What a great recipe! I just made 3 loaves tonight….YUMMY! I was wondering how you made the cinnamon sticky bread with this dough? Thanks! Laura, I just let it rise once, then before the second rise, I rolled it out, put the butter and sugar on it, then rolled it up, cut it and put them in a pan. I then let it do the second rise, and cooked it. Hope that helps! I would love to see her do a video froms tart to finish. I have tried bread a few times and it NEVER turns out. I dont think I knead long enough?? I dont have an electric mixer and do it by hand and never know when its enough and when its over done. Any suggestions or tips?? Renae – I love the questions! No worries. I typically bake the bread and cinnamon rolls, cool it and then freeze it for a few weeks (if it lasts that long!). For pizza dough, I freeze the dough, then let sit on counter and thaw, then roll out, because I am not as concerned with a rise. Hope that helps and leave more questions here if you have more. If you have them, many more do too! Renae – You want to knead the dough until it is a little elastic. When you pull it and it starts to go back to where it was. That means the gluten has begun to set up and create fibers for the rise. You want to knead long enough to set the fibers, but not so long that it will be tough. And that will take some experience, and trial and error. Keep at it, once you master bread, you will feel so great! Ask more and if anyone has recommendations for Renae, please let her know her tricks. Awesome. Awesome. Awesome. I can’t say it enough. I just made this bread and it turned out great! On. The. First. Try. This wasn’t my first attempt at making bread, but with other recipes I tend to have to tweak them a little to make it work for me. This turned out great. I made 2 loaves for lunches this week and a pan of rolls for Sunday dinner! What are wheat berries ? Wheat berries are what wheat comes from. You grind wheat berries to make flour. Thank you for your response, I had no idea. I also want to thank you for your site, my wife and I made your other Pizza Dough the night before, as well as the Pizza Sauce. We really enjoyed the time together. Two of my three boys were home and they stayed at the kitchen table and chatted about their day while my wife I made the dough providing some much needed time together. The next day (last night) I got home from work, assembled the Pizza. placed it in the oven and as the family arrived and departed they grabbed a slice. All commented on how GREAT, the Pizza tasted and requested that it be made from now on. Wow, I am so happy you not only enjoyed the recipes, but were able to create a family night with them. That is our favorite thing to do on Fridays with our kids too. Oh, just know, it freezes really well. So it will take even less time! I make quite a few batches and freeze a ton, then I have plenty on hand for last minute dinners. You can try replacing, but some good things to help bread rise can be using a tablespoon or so of baking soda, or xanthum gum (and even a few tablespoons or arrowroot flour with it), or a few tablespoons of vinegar. Hope these help! Jo- it is a personal choice, not necessary. Maybe due to my climate it works better for me, but I have found my bread is much fluffier if I give it one more rise. but it is not necessary! I want to make the sticky buns with this dough recipe. I can’t find the recipe for the center. I would love to know what you use. Wow! No joke, this is the best whole wheat bread I have ever eaten. I have dreamed of bread like this since I started baking. Thank you so much for this recipe, it is rising in the bowl at this very moment! So glad you enjoy it!!! Thank you so much for this turtorial/recipe! I have never made bread before, but always wanted to give it a try! I made two loaves last night and my family loved it! I will definetly be making this from now on. I am on my back into the kitchen to make a fresh loaf for my parents and small rolls for Easter Brunch! I want to make the bread with coconut oil but it doesn’t state to used it in a solid or liquid form… which did you use? I would melt the coconut oil and use in place of regular oil and it will work beautifully! Hi there, do you know the nutritional values of the bread? I love it and have been using this recipe for quite some time now, but I’m counting calories/pts and want to keep using this bread. Any ideas? 🙂 Thanks! wondering if I can substitute sugar for the honey? And if so how much sugar do I use?